Our friends at Roberts are preparing for the Holidays with a 20% off sale on name brand camera bags and two early December Expos in Indianapolis and Carmel Indiana, USA. For further information check out the Roberts Home Page. 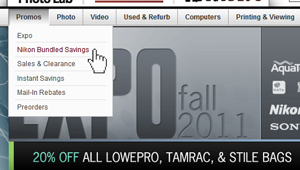 While you are checking out the Roberts site, make sure you click on the Nikon Bundled Savings Promo button. You will find savings on the Nikon L19 Camera with Case, 2 year Warranty and 2GB SD Card (less than $50.00 USD) and a nice assortment of Nikon 1 plus lens kits. Less than a week remains for your opportunity to take advantage of the Phase One 50% savings offer on Capture One Pro 6. Capture One Pro 6 brings out the very best in your images with tailor-made Nikon camera profiles. See why many of our members describe Capture One as the choice for Nikon photographers. For a limited time, you can save 50% and get Capture One Pro 6 for 199 USD / 149 EUR only. The offer expires November 20th. Use the voucher code “CONIK2011” to claim your discount here. The Nikonians Academy will be in Boston and in Las Vegas this December, 2011. Don't miss the opportunity to learn more about your camera, your flash and your vision before the year is over. Acclaimed as instructors and professional photographers they will share their experience and will surprise you with what you have been missing. Hurry up. There are still a few seats available, but not that many. By popular demand we have added coverage of the D90 to our in depth camera body workshop. So if you have a D90 and want to learn all about it, join our Master your D90, D7000, D300/D300S, D700, D3/D3S/D3X In Depth workshop! The first opportunity for this workshop is on 26 November in Utrecht, with reruns scheduled in March 2012 (Utrecht and London). PhotoBert Fall Sale - 10% Off All Products! PhotoBert, makers of the popular CheatSheets and the amazing Helicon Pro focus-stacking software, is slashing prices by 20% off of CheatSheets and 10% off of everything else (accessories & HeliconFocus). This offer won't last long, so head on over to start your holiday shopping! Your discount code can be found at the Nikonians Rewards page. Come and explore German's industrial heritage like you've never seen it before — After a very successful first run of this workshop, we have decided to schedule the Industrial Heritage photography workshop again on 14 and 15 April 2012 in Dortmund. We will take you to places normally closed off to the public, providing you with truly unique photographic opportunities! Visit the Nikonians Academy Europe forum for comments and sample images from our participants. PocketWizard is offering a USD25 rebate in the US only for their innovative MiniTT1 and Flex TT5 Wireless Flash Triggering Systems for Nikon. The mail-in rebate runs through 30-November-2011. Visit Nikonians Rewards to claim your rebate today! In addition to the Netherlands, we have now also published 2012 dates for our UK (London area) workshops. Check out our website for the current schedule of the Master your Nikon D7000, D300, and D3, Master Nikon Capture NX2, and Master the Nikon i-TTL Flash System workshops. We have just added new 2012 dates for our Netherlands workshops. Check out our website for the current schedule of the Master your Nikon D7000, D300, and D3, Essential Image Processing Techniques, Master the Nikon i-TTL Flash System, and the Master Wildlife Photography: Birds of Prey workshops.